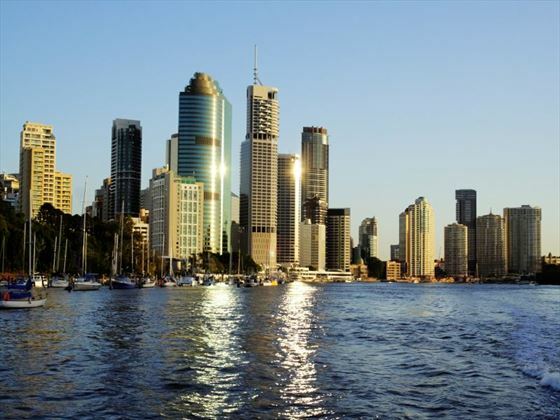 Explore some of Australia’s most beautiful and diverse landscapes on this brilliant seven day self-drive, starting and ending in Brisbane. 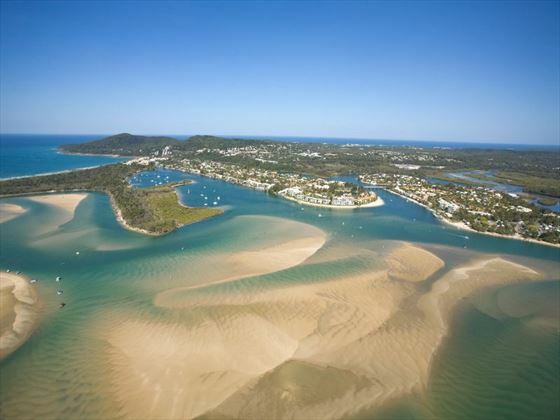 Begin with a trip to the mountainous Lamington National Park and spotting platypus in Canungra Creek, before exploring the sophisticated town of Noosa and exploring the naturally stunning Fraser Island (ATS). 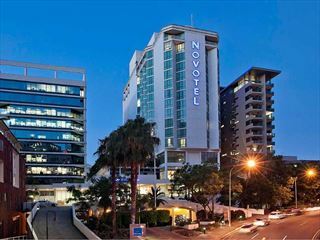 Once you’ve collected your vehicle you’ll follow the Pacific Motorway to Beenleigh, before continuing south through beautiful landscapes and reaching the ranges of Mount Tamborine – a gorgeous area with scenic views of the Gold Coast. Visit the quirky arts and crafts shops at Gallery Walk before journeying through Canungra Valley to marvel at its historic buildings and explore the vineyards. You could even search for platypus in the Canungra Creek, all before taking a winding stretch of road into the Lamington National Park. The day is free for you to explore this beautiful area, adorned with 20,000 hectares of subtropical rainforest, and home to a variety of colourful native birds. Walk through the tree tops 16 metres above the rainforest floor, enjoy a hike through the many trails that wind through the Antarctic Beech forest, and fully relax in the Lost World Spa (own expense). 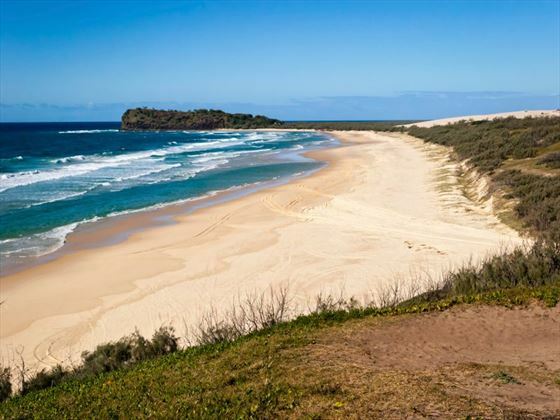 The journey to Noosa offers plenty of great stop-offs after taking the Gateway Motorway, including the wonderful Beerburrum State Forest along the Bruce Highway. 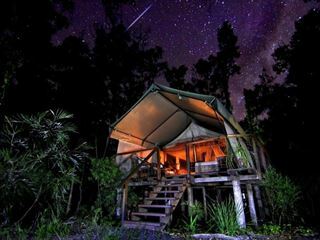 This is a beautifully diverse area, with exotic pine plantations, lush rainforest, the soaring Glass House Mountains and coastal wallum remnants, offering a truly picturesque spot to while away the afternoon. 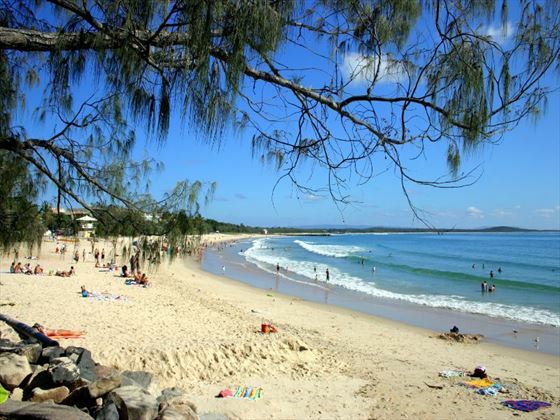 You’ll have the whole day at leisure to explore Noosa, choosing between the sophisticated dining options, the trendy boutiques, or the pretty beaches, including Coolum and Peregian. 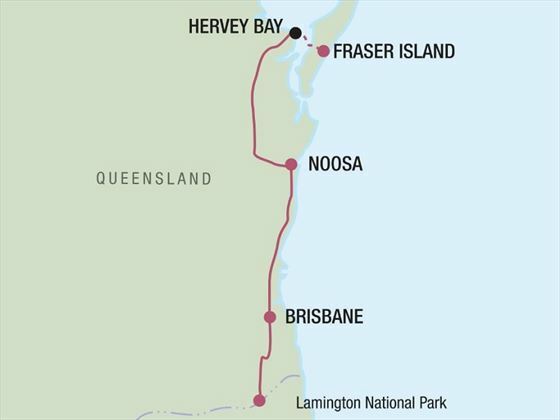 Make your way to Hervey Bay via the Bruce Highway, venturing on to River Heads village for your departure to Fraser Island. 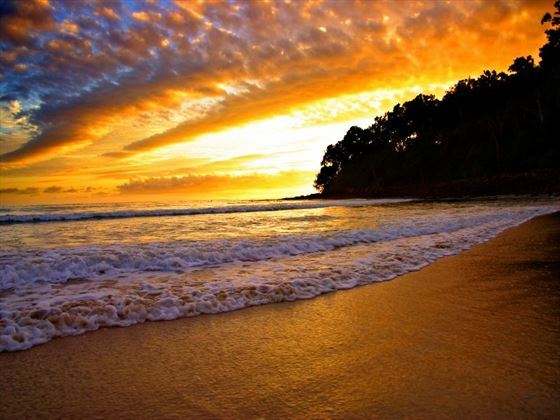 The world’s largest sand island, this gorgeous destination is a haven for nature lovers. You’ll check in to the mainland terminal and park your car (choice of parking is at own expense), before boarding the Kingfisher Bay Ferry to journey to Fraser Island. After check-in, the rest of the day will be free for you to explore. Today you will embark on a fantastic full day ranger guided Beauty Spots tour of the island, including a delightful lunch. 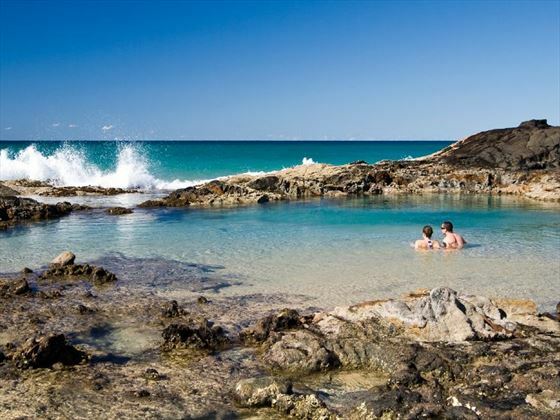 During the tour you’ll learn about the cultural and natural history of the island, as well as taking part in cool excursions including swimming in freshwater lakes, walking through luscious rainforest, and driving along the Seventy-Five Mile Beach. 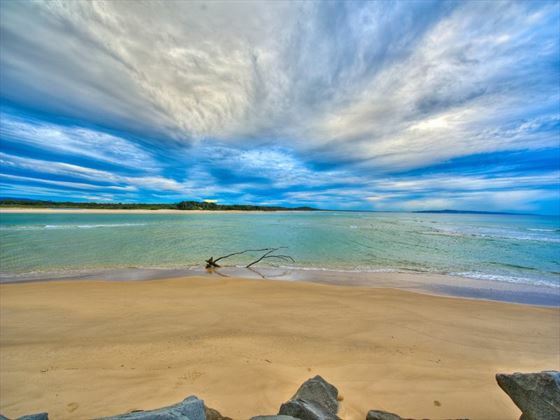 You’ll even visit the incredible Lake McKenzie, Eli Creek, Wanggoolba Creek, and Maheno Shipwreck. The evening is at leisure – join an optional ranger guided activity or slideshow, or explore the island on a spotlighting walk. 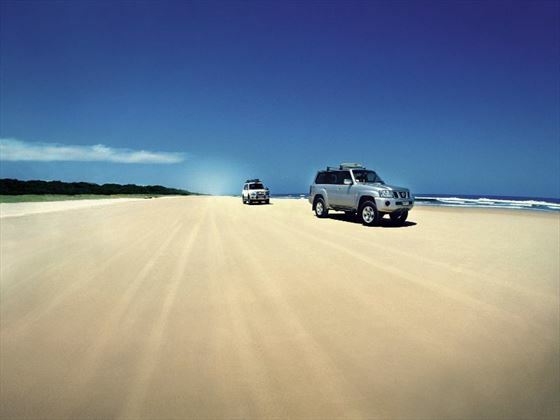 In the morning you’ll leave Fraser Island and return to River Heads. Once you’ve collected your car, you’ll drive south down the Bruce Highway, passing striking National Parks, sweeping valleys, and Queensland Bushland areas. Stop-off halfway through your drive at the small, old mining town of Gympie, full of interesting museums and statues of miners who worked during the gold rush days. 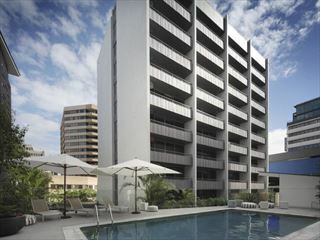 You’ll then continue on to the lively city of Brisbane, stopping to explore more of the Sunshine Coast along the way. Your car is booked until the following day and should be dropped off at the city or airport, by the same time as it was picked up on Day 1 to avoid any additional charges.